If you thought that you have seen everything in mini PCs, the Beelink Kaby G7 Mini PC I assure you that you will be surprised. This small computer hides in its entirety a powerful video game machine, although of course its exceptional performance gives for much more. It is not a cheap system, as you, usually think when leaning for a mini computer. In that case, I recommend looking at the same manufacturer’s review of the Beelink Gemini X45 Premium model, with a much more basic hardware, and a price consistent. But we do not do this review to analyze an office computer, but quite the opposite. Ready? 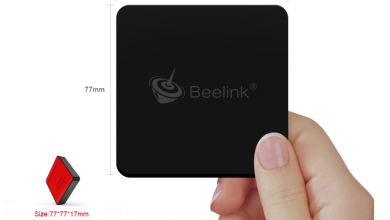 The Beelink Kaby G7 Mini PC is, by its dimensions, a mini PC, of the Beelink brand. And we say by its external size because inwardly we will see that it is a whole beast. As a PC, although its size is enough to hide it in any nook and cranny we have, because of its bold and eye-catching design, it begs for it to occupy a predominant place on the desk or table. With measures of 173 x, 153 x 65 mm and a weight that does not reach does not exceed the kilogram and a half it is really portable and light. 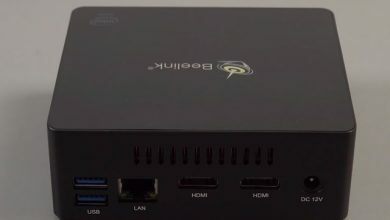 If something is going to surprise us the Beelink Kaby G7 is more than anything in the hardware configuration that encloses inside the small case. 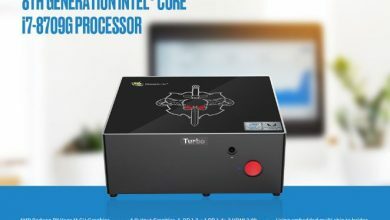 And is that nothing more and nothing less than have been equipped with Intel® Core ™ i7-8709G. What does this processor sound like? It is one of the maximum exponents of the new family of products that Intel has developed in collaboration with AMD. A technology just out of the oven that melts the eighth generation of processors with AMD Radeon RX Vega M GPUs. These two great have allied to conquer the market of convertibles, laptops and of course the mini PCs. The Beelink Kaby G7 Mini PC is equipment includes the interesting amount of 16 GB of DDR4 memory at 2400 MHz. As this storage medium mini PC has a fast drive SSD of 256 GB and has enough to be extended with disks space SATA 3.0 to 2.5 inches. What he does not have is neither a card reader nor a DVD reader. The Beelink Kaby G7 Mini PC in its limited measures does not fall short in connectivity options. On the front, apart from the power button, only one microphone/audio input is available. It is in the back area where we have all the ports of the small system. We have at our disposal 5 USB 3.0 ports and also the video outputs in the form of two HDMI and two DP. The rear area is completed with the RJ45 network input and a pair of audio jacks. The section of sound is interesting to note that the Kaby G7 is surprising to integrate a Bluetooth speaker independent of the system, which can be used from any other external device. Finally, the connectivity is covered by the classic trio, although with an improved wireless system. It has gigabyte LAN , WiFi 802.11 ac DUAL and Bluetooth 4.0. Beelink Kaby G7 Mini PC is now available on Gearbest For Just at $1199.99 using a Coupon Code: GBCNG7, After Coupon, will come back on $1369.99.